BHOLANATH Rigid Coupling, BH60-RC-10X10, Suitable for all NEMA 24(60 mm) Frame size Stepper Motors. Offers High Transmittable Torque. Special Grade Aluminium which can absorb Angular and Axial misalignment, Compact Dimensions, Backlash and Maintenance free.Suitable for all Motion Control Applications. For complete details please view Technical Specifications. 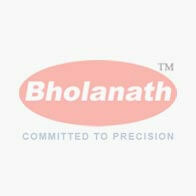 Download Technical Specification Sheet of BHOLANATH RIGID COUPLING NEMA 24 (60 MM) - BH60-RC-10X10.